Knitting for others can be a pleasure all around, with the emphasis on CAN. I know that it can also lead to uncertainty, frustration and stress (on the part of the knitter) and embarrassment (on the part of the recipient). For handknit gifts to be a success, it’s important to choose well. I need to be careful to avoid unrealistic deadlines. When knitting becomes a race against the clock, it becomes a chore instead of a joy. 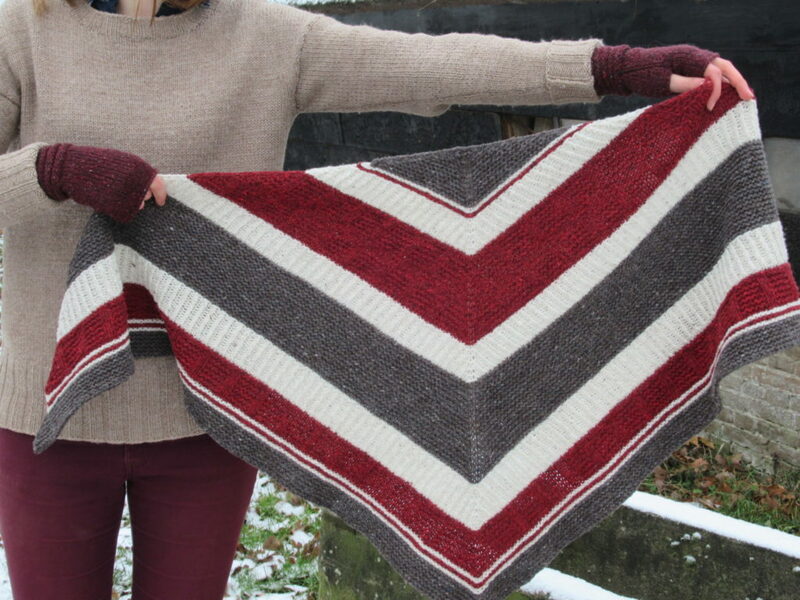 So whenever I’m unable to finish something in time for, say, a birthday, I just buy something else or write a card, and tell the person that the handknit gift will be finished soon. Keeping these principles in mind, I have had a great time knitting warm and woolly gifts over the past few months. I haven’t photographed everything, but here are some pictures of a shawl and a pair of mittens that I knit for our daughter. 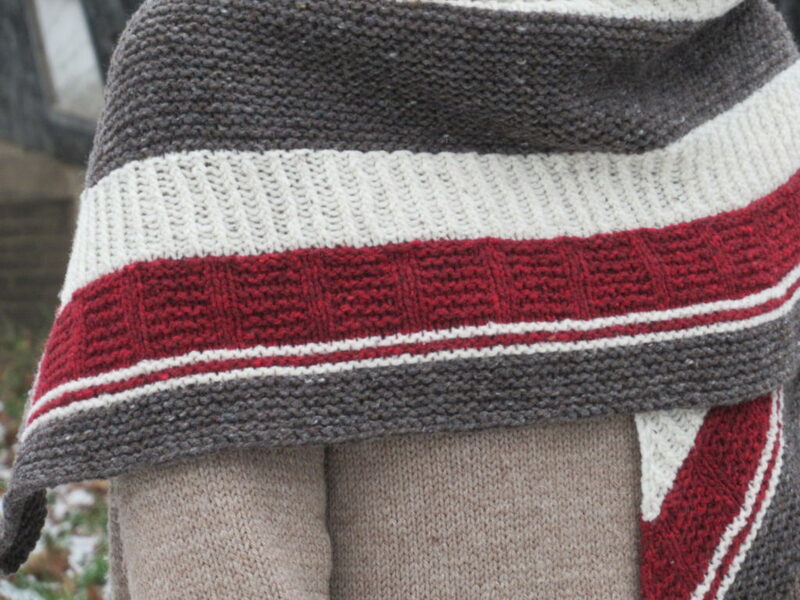 There are bands in garter stitch, twisted 1/1 rib and ’tiles’ consisting of knit and purl stitches. I was a bit worried that the twisted rib sections would be tighter than the other stitch patterns so that the sections next to them would pucker, but that did not happen at all. Bradway is not huge, but big enough to wear wrapped around the neck as a cosy scarf with a winter coat. I knit Bradway in Brooklyn Tweed Shelter, a yarn that I have been wanting to knit with for ages. It is a gorgeous rustic tweed yarn. For us, in the Netherlands, it is rather expensive, but in my humble opinion it is absolutely worth the price. The colours are fabulous and vibrant, and the tweedy flecks add another dimension. I chose Truffle Hunt (brown), Fossil (natural white) and Long Johns (red). What struck me while I was knitting with Shelter, was that each of the three colours had a different character. The red yarn (Long Johns) was slightly thinner than the other two as well as more uneven, with thicker and thinner parts. Looking at the natural white (Fossil) and brown yarn (Truffle Hunt) I could not see any differences, but to my hands they did feel very different. Truffle Hunt somehow felt less supple and the knitted fabric also looked denser than the other two colours. I even wondered if I should use a different needle size. The differences are probably due to the red being dyed and the white and brown being undyed as well as from different fleeces. In spinning I’ve noticed this phenomenon of different colours having different properties, too, even though the wool is from the same sheep breed. Having said that, the differences did not bother me in the finished shawl. The yarn softened up nicely after a good soak. And blocking evened out any irregularities. The horse? What horse? 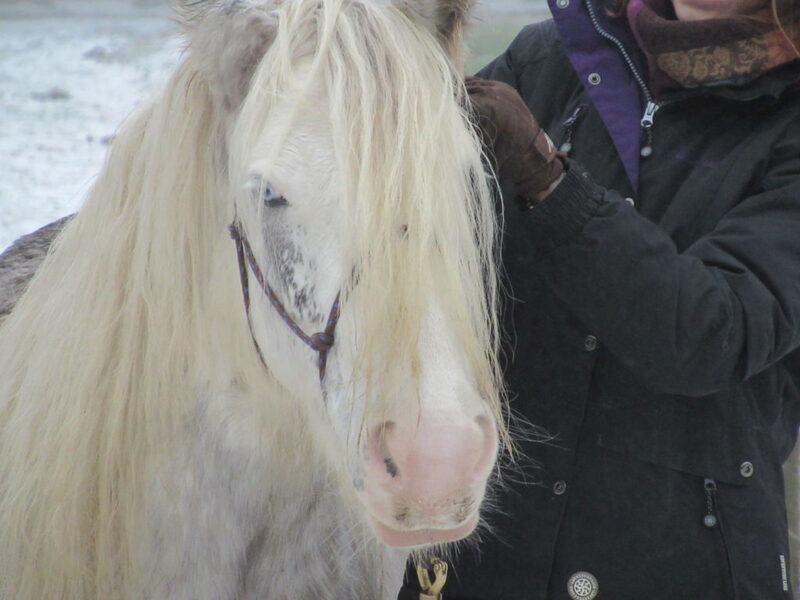 Well, we decided to combine the photo shoot for this blog post with a visit to our daughter’s horse. She’s so sweet and photogenic. I just couldn’t resist including a picture of her here, in between all the knitting. I hope you don’t mind. Hello Silver! Now, onto the mittens. 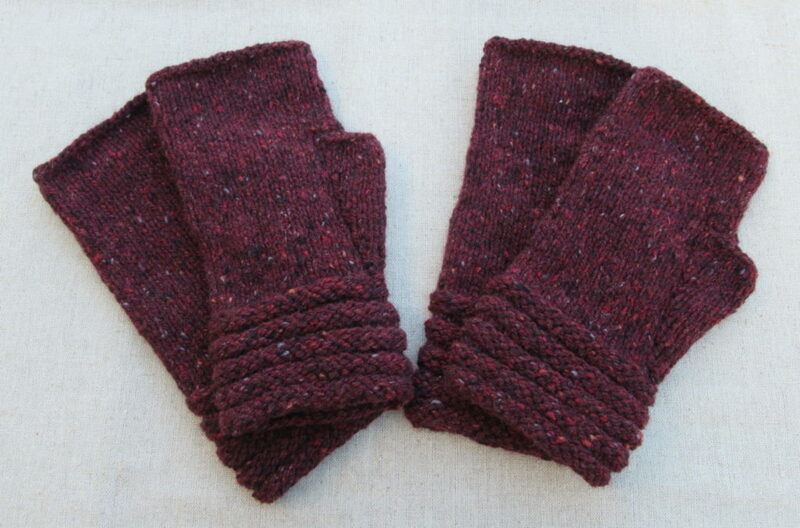 I’ve knit these Welted Fingerless Gloves several times before, in different yarns. It is such a quick and satisfying knit. Not difficult at all, and just the kind of small project for indulging in a really special luxury yarn (I used Rowan Cashmere Tweed). ‘Welted’ refers to the welts in stocking stitch (US: stockinette stitch) and reverse stocking stitch around the wrist. The really special part about these mittens is the thumb. Actually, they do not have a knitted on thumb, but just a kind of large button hole, which makes them easy to knit and fit perfectly. 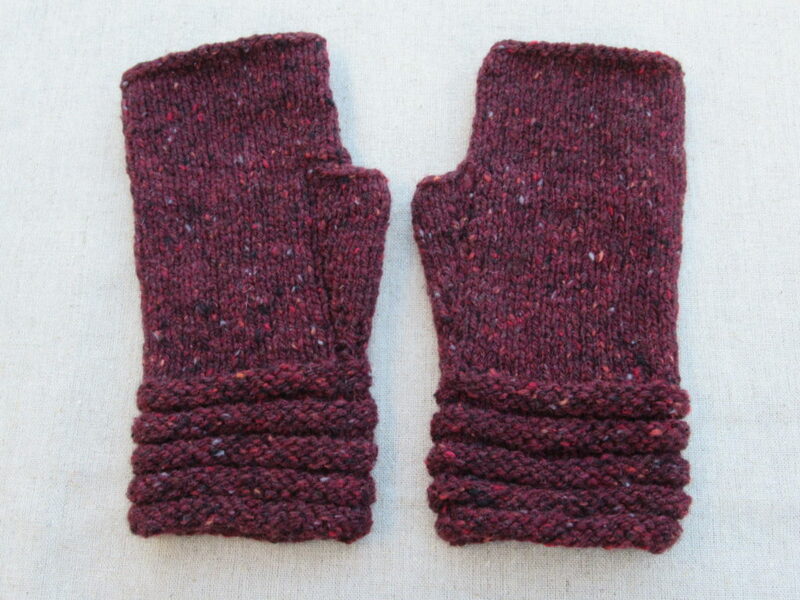 What I also like is the nice, knitterly detail of a row of purl stitches along the thumb gusset (see photo below). 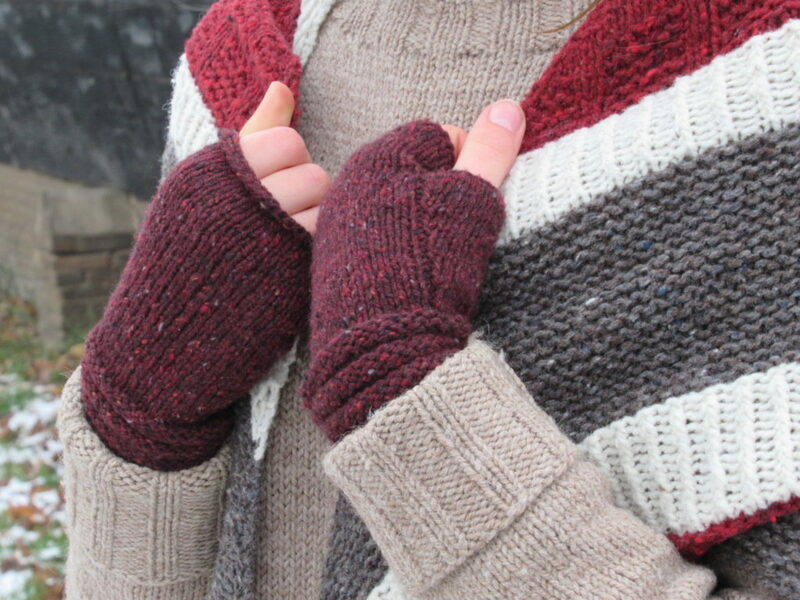 In fact, I did not knit one but two pairs of the same mittens. The other pair was for the dear daughter of one of my very best friends. I can see her wearing them walking to the bus stop on her way to uni on chilly mornings. The big gift-giving month of December is over, but I am knitting still more gifts. I have just finished a super soft alpaca cowl and am knitting two more pairs of fingerless mittens, this time for our lovely niece. If you read this, dear niece, the first pair of mittens (the pink ones) is almost finished. Not quite in time for your birthday, but I’ll mail them to you soon! I’m always on the lookout for new ideas for doable knitted gifts. So, if you have any tips, please let me know. 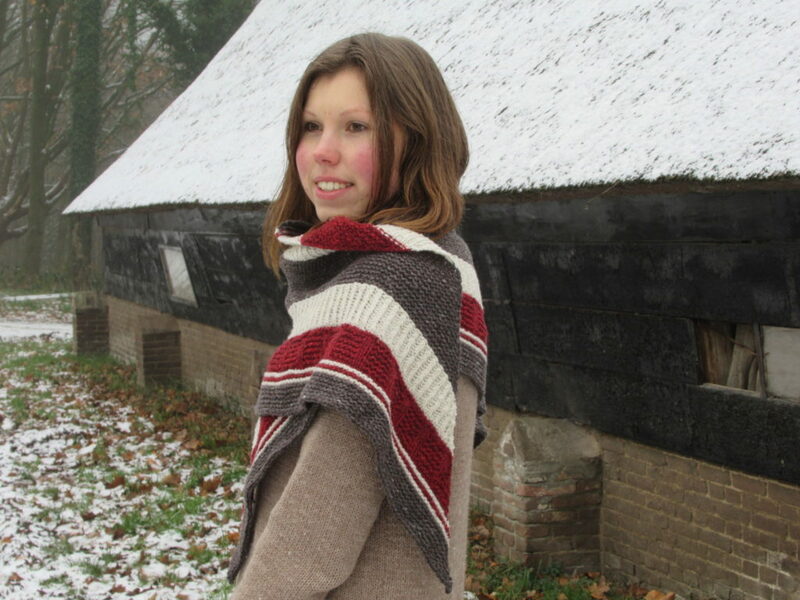 Is there a favourite pattern that you knit again and again?